Riding isn't the matter of life or death... it's more important than that. 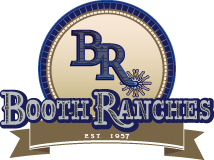 Welcome to Booth Ranches Quarter Horses. Located in beautiful Orange Cove, California, Booth Ranches is dedicated to raising high quality reining horses. We have bred our mares to some of the leading sires in the industry. Our mares have combined produce earnings of well over one million dollars.